Selection for residual feed intake (RFI) as a trait to improve production efficiency was proposed as early as 1963. A low RFI value indicates a more efficient animal and heritability estimates of between 0.28 and 0.58 have been reported for RFI in the literature. It is also reported that a 13.38 g/d reduction in methane emission was associated with a 1 kg/d reduction in the Estimated Breeding Value (EBV) for RFI, with low-RFI steers emitting 25% less methane daily. The difference in methane production in high and low RFI animals cannot be explained by the difference in feed intake alone. Possible reasons could be digestion of feed, protein turnover and overall tissue metabolism (mitochondrial function, body composition, Insulin Growth Factor-I (IGF-I) and cortisol levels), activity, thermoregulation and growth. Low-RFI animals tend to digest feed better than high-RFI animals, and as intake increases there is a tendency for digestion to decrease. The correlation between RFI and dry matter (DM) digestibility has been determined to be r = -0.33. A positive correlation exists between metabolisable energy for maintenance (ME) and RFI, as well as between ME and protein turnover. Thus protein secretion in low-RFI animals are the same as high-RFI animals, but the breakdown of protein in low-RFI animals is less. Clear differences can be observed in heat production, with low-RFI animals producing up to 21% less heat than high-RFI animals. Selection for low-RFI animals may thus reduce the carbon footprint of beef cattle. Keywords: Body composition, production efficiency, carbon footprint, protein turnover, selection indices, methane emission. Common measures of efficiency is feed conversion ratio (feed consumed/weight gain) or feed efficiency (weight gain/feed consumed). However, efficiency is highly associated with growth rate, leading to an increase in mature size, which in turn increases the maintenance cost of the breeding herd. It has been shown that residual feed intake (RFI) is independent from growth rate and mature weight, leading to the reduction of feed intake without affecting growth performance or mature size. RFI is defined as the difference between the actual feed intake and that predicted from the requirements for maintenance and growth (Koch et al., 1963). The selection for reduced RFI will reduce feed costs and thus improve beef production profitability. It will also lead to less methane emissions, since a positive correlation exists between RFI and methane production, thus reducing the carbon footprint of beef cattle (Nkrumah et al., 2006). The objective of this paper is to give an overview of the reasons and mechanisms associated with differences in RFI, as well as the different contributions to the variation in RFI. The difference in RFI and methane production in high- and low -RFI animals cannot be explained by the difference in feed intake alone. Possible other reasons could be digestion of feed, protein turnover, overall tissue metabolism, activity, thermoregulation and growth. 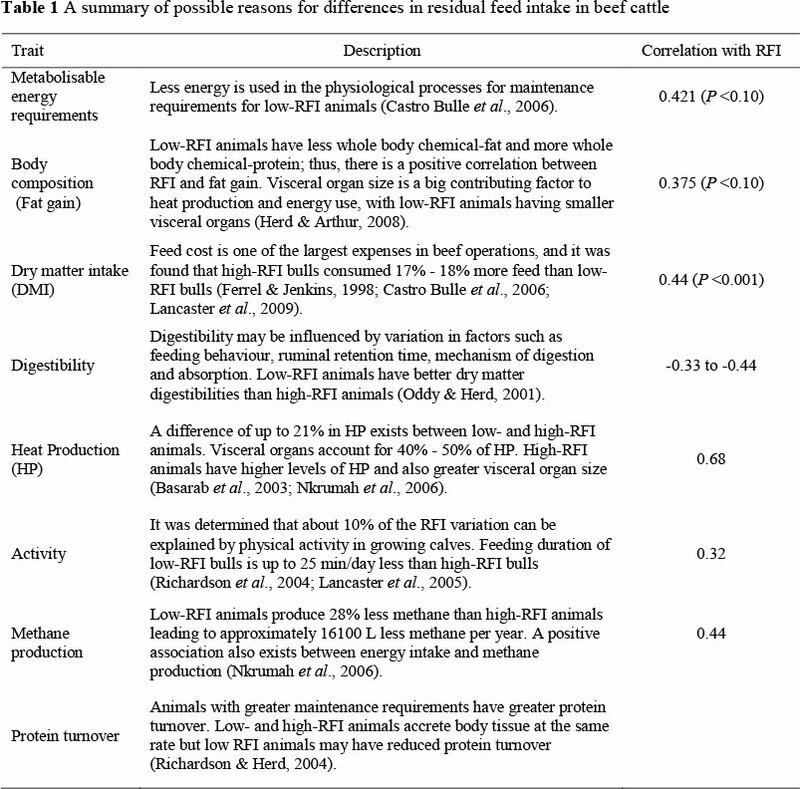 Table 1 gives an overview of possible reasons and mechanisms for differences in residual feed intake. Nkrumah et al. (2006) reported a 28% difference in methane production between low-RFI and high-RFI animals, which has the effect that low-RFI animals produces about 16 100 L/year less methane than high-RFI animals. It was also found that there is a positive correlation between RFI and daily methane production and energy lost as methane (r = 0.44). Hegarty et al. (2007) found a 13.38 g/d reduction in methane emission was associated with a 1 kg/d reduction in the EBV for RFI. A positive association exists between energy intake and methane production, with the higher intake providing more substrate for ruminal fermentation and thus there is more hydrogen available for the formation of methanogens. Thus, selecting livestock with lower feed intake can be used as means to select for animals with less methane emissions (h2 = 0.42). Hegarty et al. (2007) found that low-RFI animals emitted 25% less methane and ate 41% less than high-RFI steers, with low-RFI steers having a 24% lower methane cost per unit ADG. Mitochondrial function is an important factor in the efficiency of net feed intake in livestock (Naik, 2007) and is influenced significantly by genetics and diets (Bottje et al., 2002). About 90% of cellular energy is produced by mitochondria in metabolically active cells like the liver, kidney, muscle and brain cells (Ojano-Dirain et al., 2007). Energy production takes place in the mitochondria and cellular ATP is produced (Kolath et al., 2006). Electron leakage may take place due to inefficiency of mitochondria, with the result that 2% - 4% of oxygen consumed by mitochondria are not completely reduced to water, but are reduced to reactive oxygen species (ROS) which are very destructive (Boveris & Chance, 1973). These reactive oxygen species may cause damage to nucleic acids, lipids and proteins through oxidation and may also damage the mitochondria themselves. This may cause the mitochondria to function less efficiently (Nelson & Cox, 2008). Bottje et al. (2002) found that the mitochondria of low feed efficient chickens produced the highest levels of ROS, and in another study it was found that electron leakage in the mitochondria of low feed efficient chickens was higher than in high feed efficient chickens. 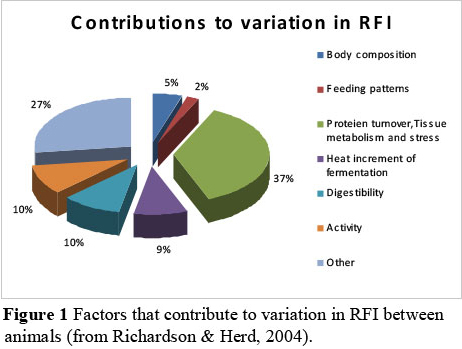 There are many factors and mechanisms that contribute to variation in RFI between animals. The contributions from the different factors and mechanisms are illustrated in Figure 1 (from Richardson & Herd, 2004). From Figure 1 it can be seen that protein turnover, tissue metabolism and stress explain 37% of the variation in RFI, whereas feeding patterns only explain 2% of the variation. In order to calculate RFI it is necessary to measure individual feed intake of animals. The cost and difficulty in measuring RFI makes the trait a strong candidate for marker assisted selection. The selection for lower RFI values will reduce feed costs, and thus improve beef production profitability which will reduce the carbon footprint of beef cattle. Studies have also shown that low-RFI cattle produce less methane. It has been shown that RFI is independent from growth rate and mature weight. Selection for RFI will thus lead to the reduction of feed intake without affecting growth performance or mature size. It is therefore, important to recognize that the most desirable animals, with respect to efficiency, may be outliers in respect of other traits, e.g. growth rate. Breeders are advised to make selection decisions based on carefully constructed breeding objectives and selection indexes and not on single traits. This work is based on research supported in part by Red Meat Research and Development South Africa and the National Research Foundation of South Africa, under grant UID 75123. The grantholder acknowledges that opinions, findings and conclusions or recommendations expressed in any publication generated by the NRF supported research are that of the authors and that the NRF accepts no liability whatsoever in this regard.